This training is currently FULL. Please register here to be put on the waitlist. You will be notified if any spots become available. This training is part of the All About Autism training series and is available at a special rate of $5! This training provides an overview of Autism Spectrum Disorders (ASD) and helps participants understand the complexities related to working with children with ASD. It reviews current research and types of successful intervention strategies. Participants learn practical strategies for assisting children with ASD in the classroom. Check out the other training events in the series! 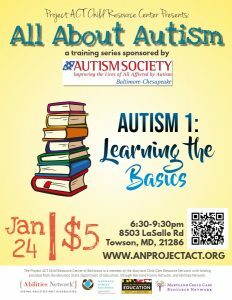 The All About Autism training series is sponsored by the Autism Society of the Chesapeake Region.